Amidst the vast entertainment corners Kigali had on Good Friday, Ishyo Arts Theatre Hall was a spot to spend an evening as the Comedy Knights gave a unique treat to revilers. The fun packed evening excited revilers as the Knights pulled it off with hilarious ‘rib cracking’ jokes that left many craving for more, living no room or a chance for boredom. With drolling jokes through conversations in; Ikinyarwanda, English, French, Kiswahili, Luganda and Kirundi languages by prominent comedians; Herve, George, Arthur, Babu, Michael among others which were all depicting daily living and situations in society- involved the entire audience as they were all touched; with too an ‘icing to this performance’ was by Junior- one of the group’s new members who perfectly ‘mimicked’ the president pulling out all laughter from each reviler as no one could contain it as he did it on stage. The ‘Sick City’- a prominent dance group in Kigali, put up a great performance in between the break; their electrifying dance moves left the crowd warmed up. Closing the show’s curtains was a performance by Tom Close, a musician who too didn’t disappoint. Through some of his songs like; ‘Ndacyagukunda’, ‘Baza’, ‘Umutima Wange’ among others touched the audience to which they joined in as they too sang; And alongside The ‘Comedy Knights’, on stage, only time was the limit. It all ended at 11pm, living no doubt in all; Good Friday was indeed ‘Good’. The weaker gender!-no more, to only cook, deliver children, stay home accomplishing the chores or do farm work she was meant. Not a word of advice-however developmental could be heard from her in meetings but only to listen, abide and implement whatever the idea was from the ‘Men’. Not even in their own marriage did she have a say! This has been a Woman of late, worldwide; yes, not only in Africa has she been through that all. It has taken real time and hardwork and sensitization raising a woman to where she is this day. From the backyard to the Office- as Employers, behind the wheels as Drivers, in lecture as Lecturers, to holy places as Church leaders, in the media as Journalists, on to the stage as outstanding celebrities to sport fields as Sports personnels; even to the ‘parliament as Political leaders’; yes, leaders- who could ever imagine this! A great symbol of love; passion and care they breed. Just as Mother Theresa of Calcutga was quoted, ‘Peace begins with a smile,’ peace and hamony they build; a child’s first sight will be a ‘smile in it’s mother’s face’, right from the smallest unit of the society-a family, so a role so big they play in nation building from the roots. ‘Gender connecting grass root women to development’ is the theme in this year’s ‘International Women’s Day’. Indeed, many women still are faced with oppression in some of the parts worldwide. Though her potential and role has been realised and appreciated, this gender still is undermined by some people in most societies worldwide. The fact that this pride has also been abused by even a woman herself can’t be hidden far, preserving it is a challenge that has to be faced by a generation ahead. She not only bears labour pains, humiliation, harassment and false accusations but also sacrifice and patience. A mother gives to her child expecting nothing in return- a great sacrifice she does all her life to you at whatever age. Blessed indeed they are that inspire every first generation of one’s life. An exemplary life she lives, a determination and patience she carries with her. A lead she deserves in the world’s building and betterment. Imagine how this world would turnout, without her! Maybe it is the word ‘Change’, but it all happens so fast; no warning for us to have a strong grip onto the sweetest moments that surpass the worries. February goes with unique memories within and around us; Pope Benedict’s resignation has made really big headlines and topics to date. Unlike death of prominent people, unending wars especially in and on Africa, diseases…a list so endless! Well as others rejoice over his decision (of resignation) – yes, not all are grieved! Indeed a shock it brought, not only to the church, but to also the entire world- Christian or not. 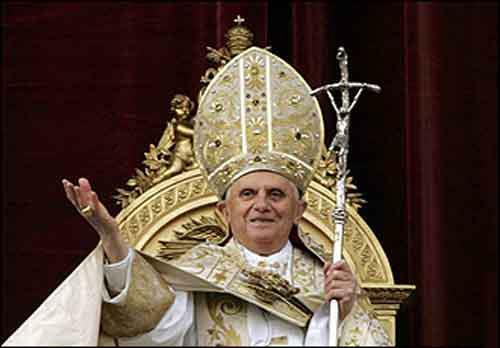 Never has it been, a Pope resigning, willingly since Pope Gregory XII in 1416. Willingly he resigned, willingly?… Formerly, Pope John Paul’s right- hand’s right hand man; proof enough that enough mentor-ship he underwent, spiritual firmness acquired, what else…? Joseph Aloisius Ratzinger’s Papacy- which has lasted for 8 years, hasn’t been a ‘that smooth regime’ all the way I believe. He states in his resignation statement that after close analysis, he recognizes his incapacity to adequately fulfill the ministry entrusted to him due to his physical strength and mind which he says have deteriorated. The Catholic Church still faces it’s challenges, which the world watches, still. As a Christian, I hope and pray- just like the rest that the Pope’s standing down is ‘only’ for the good of the Church, and not bringing ‘worse’ to the world.